Check back for the next event! On December 6, 2017, approximately 10 Citizens participated in the first Ta’an Kwäch’än Lands Act Community meeting. Good conversations were held, and a number of ideas came forward on how to proceed with community involvement. Chief and Council requested that a Public Consultation process be designed to seek input from Ta’an Kwäch’än Council Citizens with a vision of passing a Lands Act. It is essential that Council and Citizens continue to be involved during the development of the Ta’an Kwäch’än Council Lands Act to ensure that it is a document developed by the Ta’an Kwäch’än Council community that is also fully endorsed by Council. The Lands, Resources and Heritage (LRH) department is leading the process and will be working with other Ta’an Kwäch’än Council departments throughout the development of the legislation. To fill out the survey, download the fillable pdf. Once you have answered the questions, save it. 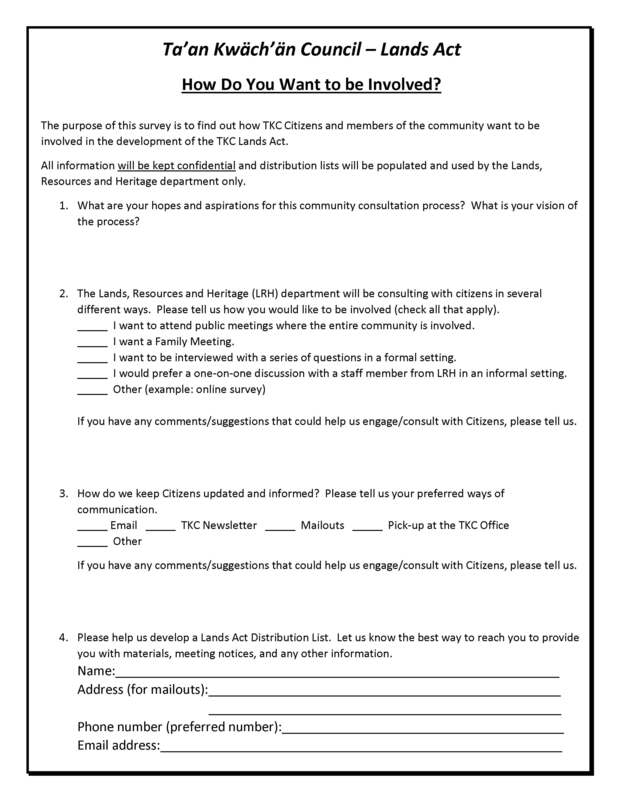 Either attach it to an email and send it to landsact@taan.ca or print it and drop it off at the Ta’an Kwäch’än Council office at 117 Industrial Road, Whitehorse.